U.S.S. 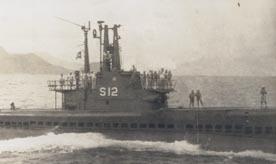 Plaice, shown here in a postwar photograph in service as the Brazilian submarine Bahia, was launched on 15 November 1943 at the Portsmouth Naval Shipyard, sponsored by Miss Eleanor Fazzi, the sister of F2c Victor A. Fazzi, who died in action aboard Yorktown at the Battle of the Coral Sea. She was commissioned on 12 February 1944, with Lieutenant Commander Clyde B. Stevens in command. Following training and trials, Plaice set off for the Canal Zone on 15 April. En route, she heard a series of underwater explosions off the Virginia Capes, which was believed to be the sinking of a Victory ship in the area, as was reported in a message received later in the day. The following day, while making a trim dive, a periscope was sighted and a sound contact was made with what was believed to be a u-boat. The crew was sent to battle stations, but contact was lost. Plaice transited the Canal on 24 April 1944, stopping in Panama City for four days to carry out minor repairs and allow liberty for the crew. She arrived at Pearl Harbor on 13 May, where she continued training in prepartion for action. She departed on her first war patrol on 4 June 1944, sent to the area of Chichi Jima. Plaice pulled lifeguard duty, and was also very active in hunting enemy shipping. Her bag for this patrol was reported as two freighter totally 8,000 tons, a 9,500-ton transport, and a 1,360-ton destroyer, for a total of 18,900 tons. Wartime tonnage estimates often proved overly optimistic in all Navies, and this appeared to be no exception. Examination of Japanese records after the war found that Plaice had actually sunk on three vessels, the 986-ton ex-gunboat Hyakufuku Maru, the 857-ton ex-net-tenderKogi Maru, and the 300-ton Submarine Chaser No. 50. JANAC, of course, had the advantage of access to Japanese records, and also didn’t have to identify targets while under the pressure of making an attack. Plaice ended her first war patrol at Midway. Departing Midway for her second war patrol on 17 August 1944, Plaice was sent to patrol in the Nansei Shoto area. She got one hit on a Kongo Maru class liner, which had been converted as an auxiliary cruiser, on 7 September. On the 24th, she fired four torpedoes at a Fuso class battleship, briefly stopping its screws. Three days later she sank the 800-ton Coast Defense Vessel No. 10, and put three fish into a transport. Only the coast defense vessel was allowed post-war. The patrol ended at Midway on 7 October, and the following day Plaice set out for Pearl Harbor in company withThresher. Following maintenance and crew recuperation at Pearl Harbor, Plaice set out on her third war patrol on 9 November. Patrolling in Empire waters, off Shikoku and Kyushu, she found no targets on this patrol. Plaice ended her third war patrol at Guam on 20 December 1944. Plaice‘s fourth war patrol commenced from Guam, and found her patrolling in the Luzon Straits-Formosa areas. During this patrol she was part of a large wolf pack, which also included Archerfish,Batfish, Blackfish, Scabbardfish, and Sea Poacher. This 58-day patrol produced only a single worthwhile target, a small convoy consisting of two freighters and three escorts. Three attacks were made, resulting in only a single hit. On 23 March, 1945 Plaice ended her fourth war patrol at Midway. When Plaice departed Midway to begin her fifth war patrol on 26 April she was under the command of Richard S. Andrews. During this patrol she was involved in several surface gun actions against small Japanese luggers, sea trucks, and fishing vessels. Plaice sank four of the sea trucks and two luggers, and damaged a pair of fishing vessels. She ended this patrol at Pearl Harbor on 13 June 1945. Plaice‘s sixth and final war patrol began at Pearl Harbor on 18 July 1945. She made no enemy contacts during this patrol, but did rescue five Army aviators from a downed B-25, transferring them to a Navy patrol bomber the next day. The war ended on 15 August, with Plaice still at sea. Nine days later she ended her patrol at Midway. With the war over, Plaice operated in the Pacific until November 1947, when she was placed in reserve at Mare Island. She was reactivated 18 May 1963, to prepare for transfer to Brazil as part of the Military Assistance Program. She was transferred on 7 September 1963, with Plaice on five-year renewable loan. Brazil renamed her Bahia, and gave her the number S-12. In 1966, the Brazilians updated her with a new conning tower fairwater, similar to the “Atlantic Sail” given some modernized American fleet boats. In 1973 she was stricken from the Navy list and sold to the Brazilian Museum of Naval Technology in Santos. She was towed there and placed in a dredged channel for conversion to a permanent exhibit and memorial. This is where most histories leave her. Checking Brazilian sources, however, discloses that the proposed museum conversion was never accomplished, and she was towed back to Rio De Janeiro, where she was scrapped. Plaice received six battle stars for her World War II service.